The body of this tall silver sprinkler has been chased with bamboo and springs of plum or prunus blossoms against a ring matted background. It sits on a broad foot repoussed with rococo-like floral and flower motifs. The stem is chased with acanthanus leaves, and the head is in the form of a six-petalled flower. 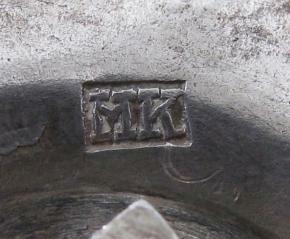 The base is stamped twice with ‘MK’, a maker believed to have operated in Guangdong (Canton) in the second half of the nineteenth century but as yet only known by those initials. Chan, D., Chinese Export Silver: The Chan Collection, Asian Civilisations Museum, Singapore, 2005. ‘MK’ mark to the underside of the foot of the sprinkler.